Readings: Deut 26:16-19; Mt 5:43-48. 1/ First Reading: RSV Deuteronomy 26:16 "This day the Lord your God commands you to do these statutes and ordinances; you shall therefore be careful to do them with all your heart and with all your soul. 17 You have declared this day concerning the Lord that he is your God, and that you will walk in his ways, and keep his statutes and his commandments and his ordinances, and will obey his voice; 18 and the Lord has declared this day concerning you that you are a people for his own possession, as he has promised you, and that you are to keep all his commandments, 19 that he will set you high above all nations that he has made, in praise and in fame and in honor, and that you shall be a people holy to the Lord your God, as he has spoken." 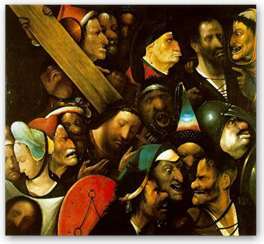 2/ Gospel: RSV Matthew 5:43 "You have heard that it was said, `You shall love your neighbor and hate your enemy.' 44 But I say to you, Love your enemies and pray for those who persecute you, 45 so that you may be sons of your Father who is in heaven; for he makes his sun rise on the evil and on the good, and sends rain on the just and on the unjust. 46 For if you love those who love you, what reward have you? Do not even the tax collectors do the same? 47 And if you salute only your brethren, what more are you doing than others? Do not even the Gentiles do the same? 48 You, therefore, must be perfect, as your heavenly Father is perfect. I. THEME: We become perfect by loving our enemies. Freedom to choose is the most basic human act and is done daily. When one must make a decision, he used to base on the end which he values more, such as: convenient, long lasting, easy to do, etc. For example, when people select leaders to govern their nation, city or community, they choose the individuals who have more abilities than normal people so that they can fulfill their responsibilities. God, Who is the Leader of all people, also selects the nation and the individuals to do His will. The history of the Old Testament and the New Testament gave us many examples of God’s selection, such as: He chose Israel as His people, Abraham, Moses, Aaron, Joshua, King Saul, King David, all the prophets, and Jesus. Today readings emphasize the reasons why God select a nation and a group of people. In the first reading, the author of Deuteronomy gave the reason why God chose the Israelites to be His people: to keep God’s decrees and commandments. In the Gospel, Jesus chose his disciples and commanded them to love and to pray for their enemies. The reason for this is by doing that, they become perfect as their Father in heaven is the Perfect One. 1/ Reading I: You shall be careful to do them with all your heart and with all your soul. Why did God choose Israel over all other nations? There were many reasons: He chose them because they are Abraham’s descendants. God chose Abraham and blessed his descendants because Abraham completely trusted in God and firmly walked in His way. The other reason is for them to set an example for other nations to know how to obey God’s law and decrees. 1.2/ The selected nation must be different from other nations: Since Israel is the selected nation, they must reflect God’s holiness. The author of Deuteronomy listed out the Israelites’ duties and rights. - In Amos: “I saw the Lord standing beside the altar, and he said: Strike the bases, so that the doorjambs totter till you break them off on the heads of them all! Those who are left I will slay with the sword; not one shall flee, no survivor shall escape” (Amo 9:1). - In Hosea: “Woe to them, they have strayed from me! Ruin to them, they have sinned against me! Though I wished to redeem them, they spoke lies against me” (Hos 7:13). 2/ Gospel: Love your enemies and pray for those who persecute you. 2.1/ Love your enemies: Jesus knew well what the human law taught: “You shall love your neighbor and hate your enemy.” But he taught his disciples: “I say to you, Love your enemies and pray for those who persecute you.” He knew it isn’t easy to love one’s enemy; but people can achieve that if they are permeated by God’s love. The first thing we noticed is the Greek verb “agapan.” This verb was used only by the Christian authors. There are two more Greek verbs which are also meant “to love”: “erein” and “philein.” First, people must be permeated with God’s love: “Abide in me, and I in you. As the branch cannot bear fruit by itself, unless it abides in the vine, neither can you, unless you abide in me” (Jn 15:4). Secondly, after permeated by God’s love, people can love their enemy with the same love: “A new commandment I give to you, that you love one another; even as I have loved you, that you also love one another” (Jn 13:34). To pray for one’s enemy is the best way to forgive and to begin to love them. If we don’t pray for them, we can’t forgive them. Jesus didn’t only teach his disciples, he set a perfect example for them by praying for his persecutors on the cross: “Father, forgive them; for they know not what they do” (Lk 23:34). St. Stephen, the first martyr, also imitated Jesus to pray for his persecutors: “Lord, do not hold this sin against them” (Acts 7:60). (2) We are called to be perfect: “You, therefore, must be perfect, as your heavenly Father is perfect.” To become perfect requires us to live according to the excellent standard; if not, we are just average people. If people see in us a life which is different with them, they can recognize we are God’s children, as Jesus said: “By this all men will know that you are my disciples, if you have love for one another” (Jn 13:35). - We are chosen to live for God; therefore, we must live according to the way that God prescribes for us. - Two of the requirements of Jesus’ disciples are to love our enemies and to pray for our persecutors. To deny to do what Jesus commands is to deny to be his disciples. - In order to achieve these, we must be first permeated by God’s love.